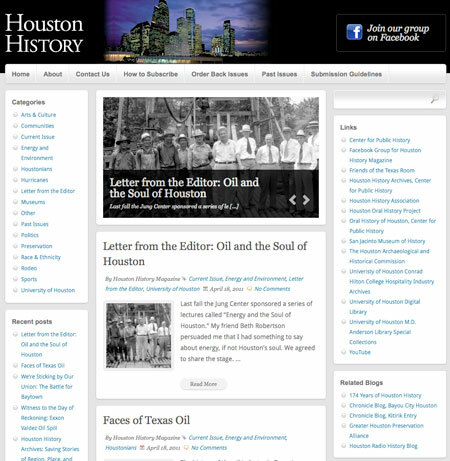 Today, the WordPress-based website for the Houston History Magazine launched, which represents a significant redesign for an interesting magazine that traces the history of Houston through the lens of special issues that focus on pivotal issues. My role in this project was to advise and consult the small staff of the academic magazine of what tool to use for the job, what services they need to acquire and suggest a template that would give the magazine an engaging look. I was also responsible for designing the Past Issues archive page in the new WordPress system – previously it was designed as a three-column table. I was also responsible for installing WordPress and maintaining its installations, and customizing it for the needs of the magazine. 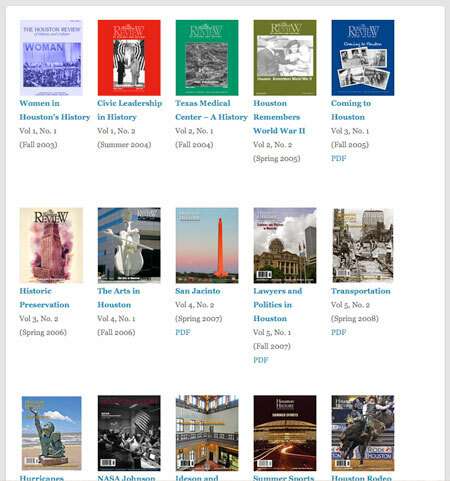 The new Past Issues archive page improves the usability of the previous page by inserting links to full-issue PDFs on the index, so readers can easily download them without opening each issue page. The design also breaks out of the previous three column table, allowing the elements to float left of each other, allowing for continued backward and forward compatibility with web trends and layout. If/when the design ever changes again, these elements will naturally flow to fit the size of their container. We chose WordPress because of my familiarity with it and its ongoing maturity as a user-friendly CMS that works best with time-oriented publications. We chose hosting the WordPress custom installation on GoDaddy because the company offered affordable web hosting with an interface that the magazine’s staff was familiar with. Hosting the system on a third party’s web server was necessary because the college does not have all the required pieces of a modern web environment in the same place, and is currently in a period of transition. Hosting the site on GoDaddy provides stability now, with the option to transfer the database of information to the college web server later. 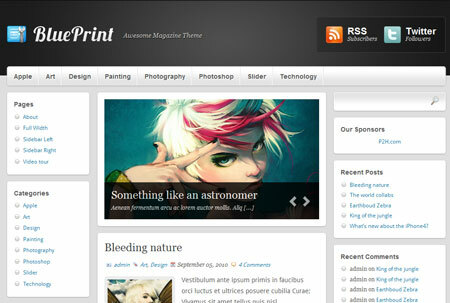 We chose the BluePrint Magazine WP 1.0 theme, designed by Dany Duchaine of DDStudios, because it allows for a sophisticated look and an engaging featured image slideshow on the homepage. This is the original design of the BluePrint magazine, which I altered to fit the needs of the Houston History Magazine.